Well, it's all about you and your well-being, gently coaxing your body to relax and re-balance itself. We know that our feet contain approximately 7000 nerve endings and a complex network of blood vessels which can be stimulated by reflexology helping to strengthen the impulses and boost the circulation. 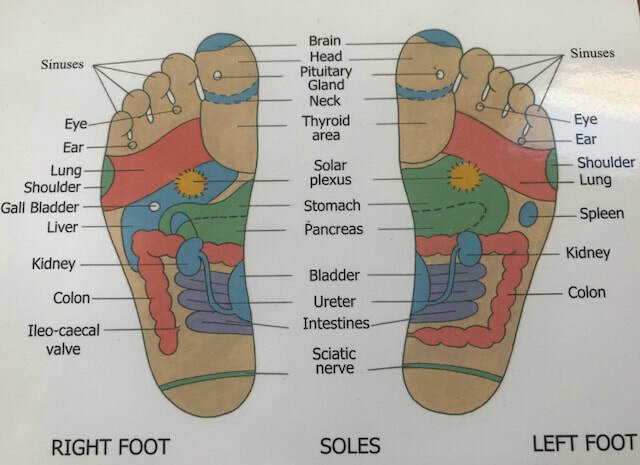 However, in addition to this, reflexologists believe that the feet are a mini map of the body and we can use this knowledge of how each area of the foot (reflex) links to a specific part of the body by working the reflexes on the feet to stimulate energy pathways. The deep state of relaxation that reflexology can induce, gives the body a chance to tap into its own healing potential. We can maintain health much more easily when we are free from the effects of excessive stress and reflexology in a soothing environment from an experienced reflexologist is a wonderful way to manage the stresses and strains of a busy life. The reassurance that comes with a touch therapy can be very important for someone who is experiencing difficulties in life whether they are suffering from the symptoms of stress, coping with chronic illness or dealing with grief. It's important to understand at the outset that everyone's response to reflexology is different and individual and so it isn't possible to know exactly how someone will react to a treatment. Generally people report to feel a release of tension, a lifting of mood, a positive well-being and improved sleep. "Whilst there is not yet a large enough body of evidence for us to make clinical claims in its true effectiveness, there have been some positive research projects carried out regarding reflexology. The only real way to know if reflexology will help you is to try it!" Jean Carpenter MAR mBANT is a reflexologist and nutritional therapist based in South Northants.